Transform your photos & videos with unbelievable chroma key video editing software 123 Video Magic Pro. The perceptive interface & extraordinary results make 123 Video Magic Pro ideal for beginners as well as professionals. It facilitates the users to realize a new world of magical & innovative possibilities. Employing green screen photography & videography technique was never so easy. 123 Video Magic Pro is an easy to employ software program that enables you to edit and customize videos/images. It helps in making supreme, professional videos quickly and easily. 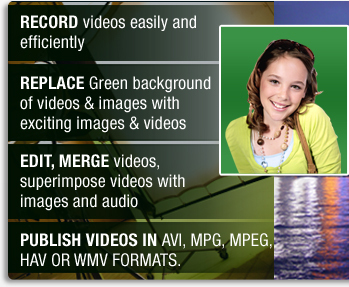 Green background of images and videos can be replaced with videos & images of your own choice. With 123 Video Magic Pro, you can record a new video in front of a green background with the help of a web cam or other video recording device or use a preexisting video having a green background. The software can merge 2 videos, superimpose the videos and images to your videos and also superimpose audios. The software has fast previews and attractive graphics. 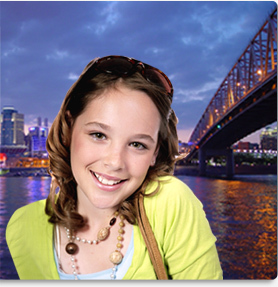 Green Screen technology opens new avenues for photo enthusiasts. The green background of the images and videos can be replaced with digital background images and videos based on exciting themes. Sample theme images and videos to change the green background are also there within the chroma key video editing software. Professionals can use the software for making portraits, green screen photography, modeling, wedding photography, and other purposes.